Has two OFF copies of all Special Color Genes. Bay - A brown or red body color with black points (mane, tail and legs). ​Has two OFF copies of all Special Color Genes. White - Technically speaking, there is no such thing as a white horse. White is not an official horse color in and of itself. That said, we have all seen horses which are white. These horses are either actually "Gray" horses or they are some form of the Cream Gene colors. Gray horses turn white over time, but very, very occasionally, this can happen so quickly that it happens in utero and the horse is actually born already "grayed out." Most of the time, however, a gray horse is born some other color and begins to get a sprinkling of gray hairs as it ages, possibly as early as its first year but sometimes not for decades. These white hairs increase, causing many (often striking) intermediate Gray colors lasting months or years before they increase to the point that there are no longer anything but white hairs on the horse. At this point, the horse is completely white, but its color is still technically called Gray. Horses that are of white color are actually Gray, Perlino or Cremello. Gray (white) - ​Depending on age, these horses may be either completely white all over, or they may be in the process of turning white. These horses are born any other color and gradually turn white throughout their lives. This may take only a few years or it may take decades. Each horse is different. Thus, a horse may appear black or bay at one year of age but be pure white by the time it is ten years of age. In between, it will be a mix of these colors - often creating a stunning gray with patches of darker or lighter hair on mane, tail or legs. Some of these horses stay an in-between gray most of their lives. You can tell the difference between a gray horse gone white and one of the sudo-albino horses (cremello or prellieno, for instance) because gray horses have dark skin underneath the white, where-as the sudo-albino colors have pink skin underneath. This dark or pink skin is usually visible around the mussel and eyes. Gray imposes itself upon any other existing color over time. ​All Base Colors have possible Dun variations. ​Palomino - A golden or cream body color with white mane and tail. The body can be any shade of gold or cream, and the mane and tail, while usually white, may also be flaxen. Buckskin - A tan or golden body color with black mane, tail and legs. The body can be any shade of light brown or gold, and very occasionally is dark enough to be mistaken for bay. Black Buckskin - An off-black body color with matching mane, tail and legs. Often mistaken for a very dark brown. May not look buckskin at all, because the body color is so minutely diluted as to still look black or dark brown and the mane and tale may be the same color. Cremello - An all-over white color with pink skin and (usually) blue eyes. Perlino - An all-over white color (often tinted with yellow or orange) with pink skin and (usually) blue eyes. Can be hard to tell appart from a Cremello, but may be slightly more yellow tinged or have a more flaxen tinted mane and tail than a Cremello. Smokey Cream - An all over white color (often tinted with gray ) with pink skin and blue eyes. Chocolate (also called Silver Dapple or Taffey) - A brown body color with white main and tail. 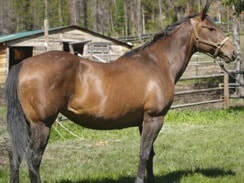 Often has darker dapples in the body. Champagne - A light, almost rose colored body with matching mane, tail and legs. Very similar to a Cremello or a Perlino. Paint - Any of the above colors with big splashes of white placed randomly over body, main, tail and legs. Paint imposes itself upon any other existing color. Roan - ​Any other color with flecks of white spread over the whole horse, often somewhat unevenly. This color can be indistinguishable from a medium form of gray, but, unlike gray, these horses are born with the white flecking and it doesn't significantly change throughout their lives. Roan imposes itself upon any other existing color. ​Did we miss any? Are there other colors we should have listed here? Email us and let us know!